We can reach Tohoku area from Tokyo easier than we expected. There are hot spring and a lot of sightseeing spots in addition to Sake and local dishes. There are also mysterious festivals that you should attend if you want enjoy Japan a lot more. 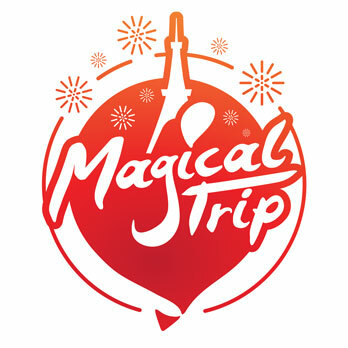 Let’s check the various events held in various locations in Tohoku. The Event For Traditional Culture and History. 1. ＜Aomori＞Tsugaru Scoop Shamisen World Convention. The Tsugaru Scoop Shamisen is played with Scoop and bottle opener. During the session, the players will be pretending that they are playing the real Tsugaru Shamisen. But we and also players can experience the same atmosphere and sound as the real Tsugaru Shamisen by beating a scoop with bottle opener. Anyone can try this Scoop Shamisen because there is no need for special skill to playing, but you need skillful experience if you want show the same sound and atmosphere as the real Tsugaru shamisen. The world convention is held in every year. The candidates beat scoop and play Japanese traditional and famous Shamisen songs, such as Tsugaru Jongara-bushi and another popular one, while wearing Happi coat and each dresses. They shout with energy during the session and live up the convention. Enjoying fun performances, you could feel Japanese traditional instrument and it’s charms. ・City’s terminal Station and the time that takes from the station. Anyone can entry. But you need to use Scoop Shamisen. Please fill out the application form and send it with sound source to the address below. Chusonji is nationally famous for the national treasure building, Konjiki-Do. 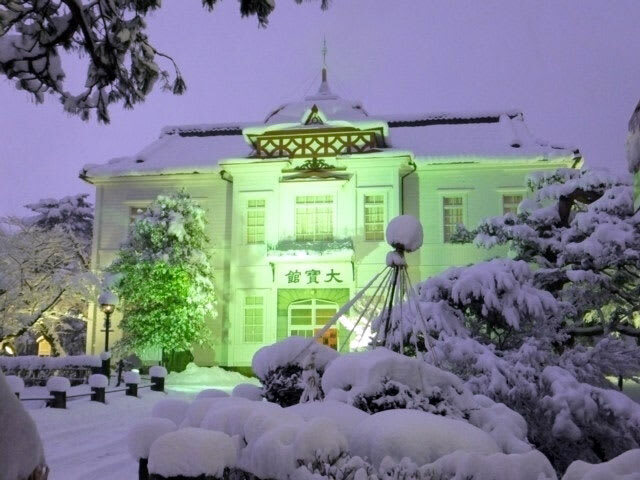 Chusonji is the first world heritage in Japan. Given a black coating and put the gold foil on in Hosangen Amida-Do, it is called Konjiki-Do. There is worth to visit to see the interior that consists of Nageshi (a horizontal piece of timber to connect pillars) and columns, and Shumidai (the platform to place and enshrine Buddha in Buddhist altar) is embellished by Golden Makie and Gokusaishiki (colorful paining). The main part of temple is embellished by metal fittings that have open-work of Hosogemon. In such great worthy temple Chusonji, the sound of temple bell rings out all over the temple in the last day of the year. The bell is rung the temple staff to sweep Bonno (earthly desires) away. The worshippers can also ring the temple bell from 0:30 am for a fee. Besides, Konjiki-Do is opened to everyone from 0:00 am to 6:00 am. General worshippers can ring the temple bell from 0:30 am for a fee. ・Closest Station and time that takes to get the temple. Associated with the sad story 「Eno Princess Legend」, 「Hatsu-ushi Festival」 will be held to quell the spirits of princess who had been kidnaped by the god of dragon. It will held on the early November, a day of the ox. It is the date when the princess planned to be a wife. When it is 18:30 pm, the brave Iwasaki area’s guys wearing headband and loincloth and Tabi (Japanese socks) will be carrying the straw bag and walking around the street. They will arrive at the temple around 19:30 and manage to dedicate the straw bag to the precinct. We can have sweet Sake and enjoy Mochi and orange throwing festival. Japanese local drum players　「Eno Hime Ryujin Taiko」 live up the festival. ・Closest Station and time that takes to get the shrine. 「Haguro Mountain Shourei Festival」 has been designated National Important Intangible Folk Cultural Property in 2014. Held overnight from New Year’s Eve to New Year ’s Day, it is also called 「Toshiya Festival」. It is festival of 「Fuyu-no-Mine」 that is one of the Haguro Shugen’s peak of four season. In this festival, 2 guys of mountain priests pray to expel the evil spirits after 100 days of seclude in the mountain. It is called 「Gen-Kurabe」. From Des.31st to before the daylight of Jan.1st, there are many events such as Toritobi and Kokubunshinji held in Kagami-Ike-mae plaza and shrine. Especially, you must see exciting tug-of-Otaimatsu by young people. The excitement scenery of men and fire clash would make us forget about cold winter. Let’s feel Japanese traditional event. About 2 hours from Sendai Station by but bounce for Tsuruoka・Sakata・Honjo・Sakata Shoko Bus Terminal. 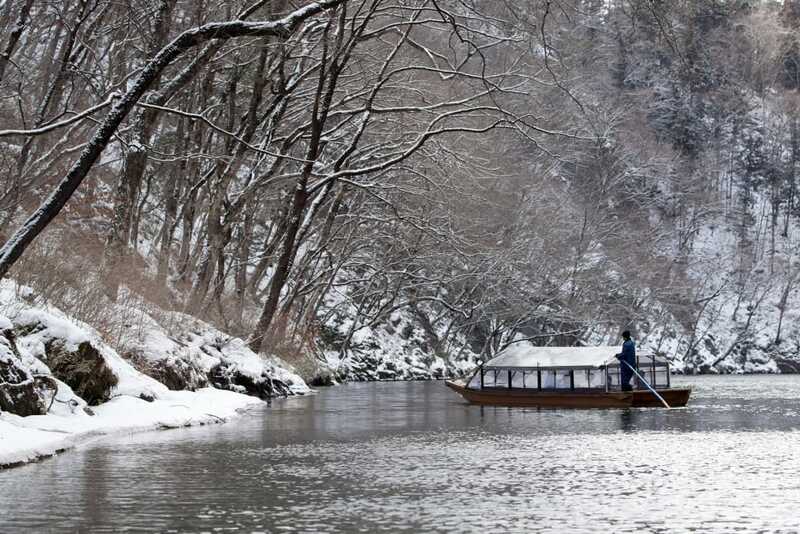 Keibikei is about 2km-length of valley along with the Mother River in Iwate, Kitagami River’s tributary. The height of this valley is as tall as 50m. About 90 years ago, Keibikei has been designated as a first Historical landmark scenic spot Natural Monument in Japan. It is also known as one of the best scenery in Japan. This beautiful valley located in secret place in Iwate has been officially introduced by Geigan Sato. This valley is named after it’s peculiar form of quay wall. The turning point of boat activity, it is deep side of Miyoshigaoka named Shokokyu. There are huge quay wall on the opposite side of this Shokoukyu and it looks like 「Nose of Lion」. We can enjoy this great landscape from boat. From the winter season, Des.1st, we can also enjoy about 2km-depth of huge and beautiful precipitous cliffs while warming in Japanese Kotatsu on the boat. It is called 「Kotatsu boat」. We can also enjoy having local dishes like Nabe dishes and Kama-meshi. ・Closest Station and time that takes to get the valley. About 50 min by Ofunato Line from Ichinoseki Station. ・Closest Station and time that takes to get the ground. About 1 and half hour from Tohoku Main Line Train from Fukushima Station. Ice Rime is created in some special and particular condition of climate and trees. It is like the beautiful art of nature which is famous worldwide. It’s beautiful and colorful figure emerges out of complete darkness is very the world of fantasy. This beautiful scenery is popular in all over the world and a lot of foreign tourists have visited here to see it. It is also interesting that there are different appearances between day time and night time. Especially, the Ice Rime that lightened up with colorful lighting around the terminal of Zao LOPEWAY, Zao Sancho Station, let us see quite beautiful and fantastic scenery. If you could, you should choose the day when it is sunny and clear air, then the Ice Rim would be more beautiful and shining brightly. 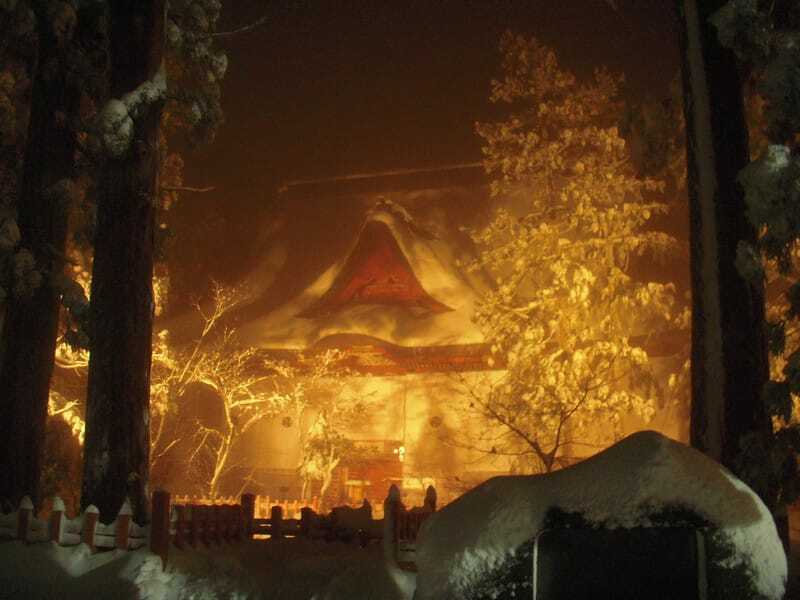 The recommended spot is Jizo-Sancho Station (altitude 1661 m) observation. The nature art of Ice Rime on the surface of Jizo Mountain can be seen from there. Besides, you can also have good hot drink the restaurant on the top of the Jizo Mountain. About 50 min by bus from Yamagata Station to Zao Onsen Bus Terminal, and about 10 min walk. This marathon will be held in Iwanuma city, Athletics Stadium. It is the place that is flat and easy to run for everyone. There are some course such as 10km, 5km for high school students or older, 3km for junior high school students, 2km for elementary school students, 1.5km for family. It would be good for final event of the year. In this year, as a celebration of the 25th, the draw will be held for present. In addition, we can enjoy shopping for local specialties. There are some sightseeing spot such as the lazy Abukuma River and Baji Museum, Takekoma Shrine that has Bashoku Monument. We can purchase the Manju at the shop booth in Takekoma Shrine. It would be good for souvenir. Although there is a limit of capacity for this Marathon, we can cheer on side street of the course. ・Closest Station and time that takes to get the stadium. About 20 min from Sendai Station by Tohoku Main Line Train. When it comes to winter season in Sendai, it would be Light Pageant. Also in this year, it will emerge in the main street of Sendai. It will be 32nd year for this event with the theme 「make a light in your heart together」 , there are 160 of Japanese Zelkova trees will be illuminated by as much as 160,000 of light bulbs. It would be like thousands of stars. The light bulbs that are called Star Light Wink will be lightened 3 times in a day. During the season, there will built some shop booths and ice rink in Kotodai Park and citizen plaza. In addition, there held the event named 「2017 SENDAI Light Pageant in Izumi Park Town」 from Nov. 3rd 2017 to Feb. 28th 2018, and the center area and main street of the park town will be illuminated with light pageant. Let’s enjoy the fantastic hour surrounding by the beautiful star-like lights. ※「2017 SENDAI Light Pageant in Izumi Park Town 」 will be open from Nov. 3rd to Feb. 28th. Santa Claus drives the funky pageant car around the city from on Des. 8th to 25th, 17:30～21:30. About 9 min walk from Sendai Station. Tsuruoka City is located in Shonai district in Yamagata. Here are a lot of cute and good-looking western-style buildings. You should be there if you western-style lover. We can enjoy just by looking there many western buildings. The amount of buildings is as much as the number of Yokohama Iwate and Kobe Kitano Western Style Residences. The light-up season is in the winter when the snow falls. These two of the beautiful and elegant western style architectures, Taihokan and Historic Nisidagawagun government office will be illuminated. The impressive appearance of western building will be more fantastic by illumination. Especially in snowy day, it looks so romantic. The scenery is very photogenic so why don’t you visit and take some photo. ・Closest Station and time that takes to get the location. About 2 hours from Yamagata Station by the train bounce for Tsuruoka・Sakata・Sakata Shoko Bus terminal.